Hi everyone! I'm excited to be part of the Creativation Blog Hop today. We are all sharing something we created for one of the Tim Holtz booths the Creativation show. I am sharing the large Vignette Tray I created featuring our new Collage Paper Document. There are also 2 other new SKU's of Collage Paper, Travel and Typography. 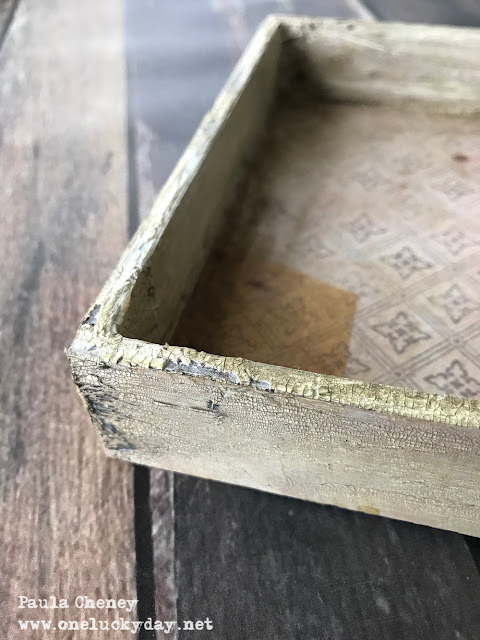 I wanted a very shabby, grungy tray for this project. Paint the large Vignette Tray with Antique Linen Distress Paint and let it dry completely. Add patterned paper to only the inside back of the tray and seal with a layer of Collage Medium. I used paper from the Memoranda Paper Stash. Once dry, I used a palette knife to spread Opaque Crackle Texture Paste randomly over the painted sides and edge of the tray (inside and out). Let dry completely (I left mine overnight but I know you only need about an hour before you can work with it). Scribble Hickory Smoke Distress Crayon over the Texture Paste. Mist with water and rub into cracks with fingers or a Distress Blending Brush. Crumple a wet wipe and pounce over surface to mottle the finish (don't skip this step). Once the tray is done, set it aside to dry. Each year we do a running change on the Paper Dolls to add new cast members and retire others. This year the updated pack should start appearing in stores around March. The three girls I chose to use for this project are from the new pack, which has lots of large images like this one to work with. I love that the large images can become the centerpiece to a project. Using Distress Markers to color Paper Dolls works beautifully, but the color can (and will) fade over time. I have had good success using a spray Fixative to combat the fade. However, having a can of spray Fixative at the ready is a challenge when teaching a class! So I decided to give Distress Crayons a try to see if I could get a similar result. After working with them all through the lead up to Creativation, they have now become my go-to product to color the dolls because the color lasts without Fixative. Projects I created back in November still look today as they did when I created them (and that is great news for me). There is a learning curve to using the crayons. I suggest starting by picking a larger image to work on and starting on the clothes. The cheeks can be the hardest part but you will get the hang of it. And remember, the paper is coated, if you hate it you can just wipe it away and start over. 1. Scribble the crayon on your glass mat. 2. Spray a puddle of water onto the glass mat next to the crayon. 3. Dip a Q-tip into the water and squeeze out excess. You want a damp Q-tip not a wet one. 4. 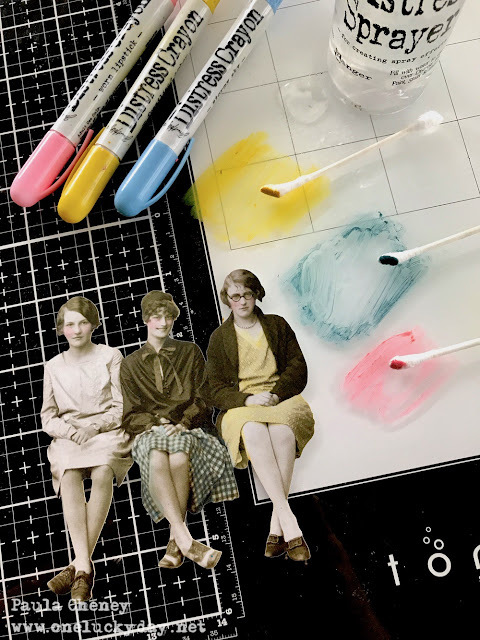 Pick up the crayon with the damp Q-tip and rub over paper doll. For cheeks, it is helpful to tap instead of rub (and it does take some practice). 5. Use the clean end of the Q-tip to rub away any excess. Will a water brush work? Yes and no. It does work and I used it almost exclusively in a small fabric journal I created using Found Relatives (a topic for another day) but you really can't squeeze the water brush because it will wash the color away. Too much water is your enemy. I do like it though because you can get into tight places since the tip is pointed and firm. So yes, you can use it but be very careful not to add additional water. I would also mention, do not take yourself too seriously. These are old photos and the tinting should be just that - mimicking old tinting which was never perfect and somewhat off kilter. The colors should look like they are lighter in some places and darker in others. That's the beauty of it! The center of the project is a Collage Frame covered in the new Collage Paper. I used my water brush to create a line from the top of the paper to the bottom and then tore it apart (the tear will follow your waterline). I brushed Collage Medium onto the frame then placed the Collage Paper over the top, covering almost the entire top portion of the frame (the Collage Paper is 6" wide and the frame is 8"). I added a layer Collage Medium to secure all the delicate edges, then dried it with a heat tool. By placing the paper across the opening in the frame, it allowed me to add lights behind and will become transparent when back lit. While the frame was still on my work table, I worked crayon into the edges of the Collage Paper and mottled it with a wet wipe to make it look more organic. I left a lot of crayon on the frame because I liked it, but you could use less if that is not your style. 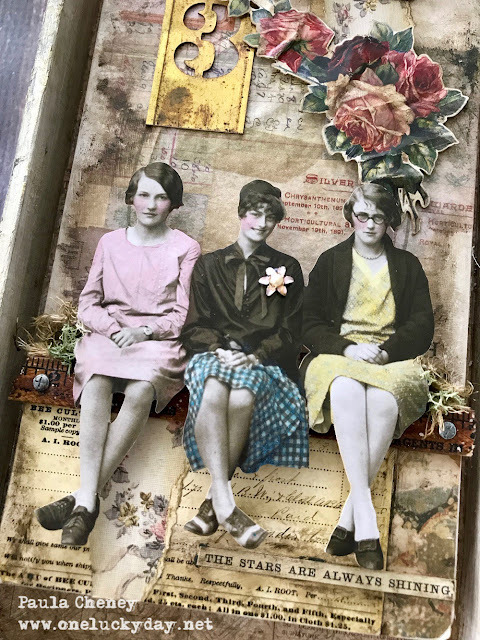 Once I had placement for the ruler for the girls to sit on, I added Layers "Remnants" to fill in the space between the ruler and the bottom of the frame. I also added ripped pieces of Worn Wallpaper because to be quite honest, who doesn't like that look? And if they don't, they probably wouldn't be reading my blog anyway, right? Again, I sealed the ephemera with Collage Medium so I could add more crayon to marry the top of the frame to the bottom even though different materials were used. The words "the stars are always shining" is from the Clippings sticker sheet. I also used bingo chips as the risers behind the girls but I suppose you could use a double stack of foam pads. Personally, I need a big bin of bingo chips in my workroom at all times just for this purpose! Oh, and the Hardware Heads...the new little faux fasteners that you see on each corner of the ruler? Well, I'm just going to tell you...buy more that you think you need because you are going to want to put them on everything...and even if there are 4 different styles in the package, I always want to use the one with the X. I just do! I added one of the new Vintage Clips to the top of the frame as well as a bow from an Adornments pack. 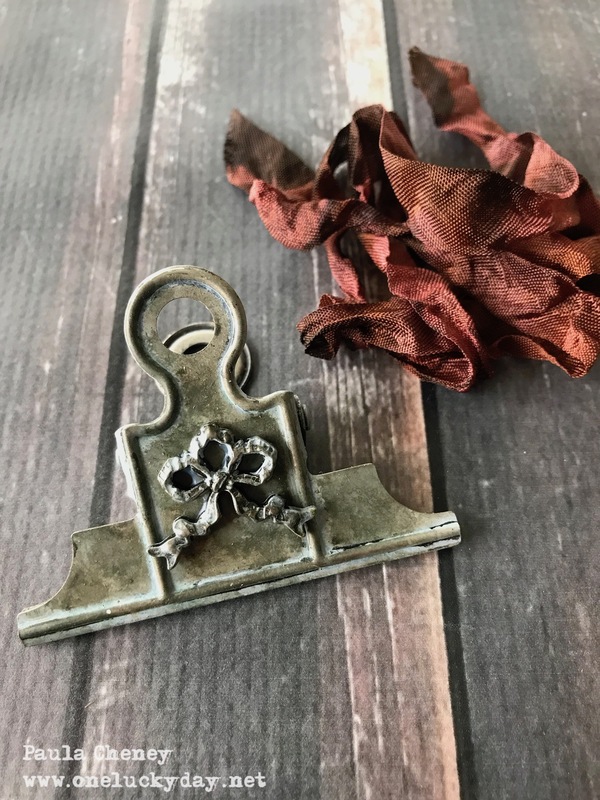 The new Stencil Chip found under the clip is a favorite from the show. It absolutely looks metal but it's made from chipboard (and it looks like that right out of the the package). I should mention the beautiful roses. For the first time we have made a running change on the Layers Botanical and that is where these roses came from. The bad news is that it will be a few months for the changeover to be complete so you will not see the new Layers Botanical until later in the spring. That being said, I guess the good news is that if you like the current Layers Botanical with the butterflies and the calling cards you have time to order a pack before they are gone. NOTE: The new pack does have butterflies but it does not have calling cards. I wish I had taken a picture of how I did the lights but it was night when I was working on it and to be quite honest, it was ugly, lol. I had my husband drill a hole in the back of the tray right below the girl with the yellow dress, inserted the string of lights from the back to the front of the tray and then wound them around in a circle until the string ran out. I used narrow masking to secure the lights to the tray (that is the ugly part). The frame needed to rest pretty high in the tray so I took 8 bingo chips and glued them in stacks of 2. I used the 4 stacks (one in each corner) to raise the Collage Frame over the lights so they just glow behind the screen. Well I hope you liked this tutorial. I do love this project and the subtle nuances that the Distress Crayons brings to the table. Next on the Blog Hop list is my friend Richele Christensen. Click on the link below to hop over to her blog! 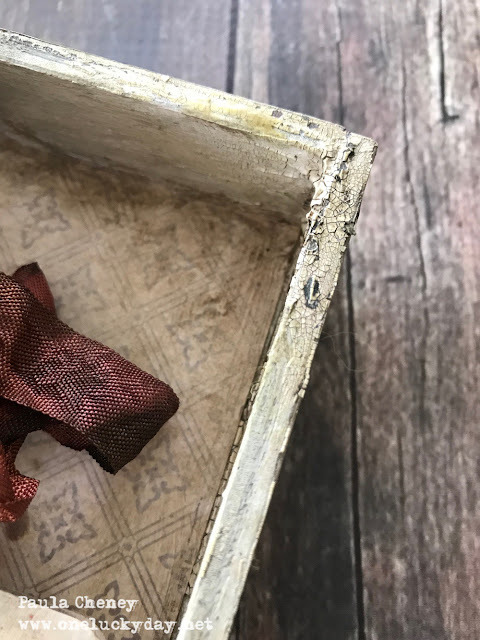 Be sure to leave a comment here before you go (and all along the blog hop) for your chance to win one of three amazing prize giveaways. Comments must be left by Feb 9th at midnight PST and 3 winners will be announced on Feb 10th! Paula -- the crackle looks great and the lights make the project. Love it. 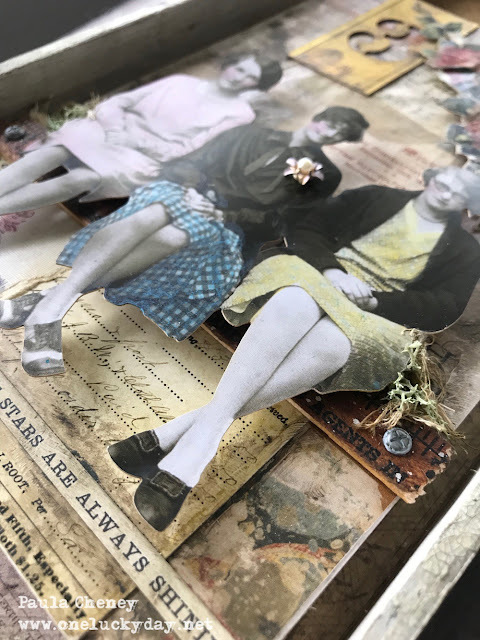 Such fabulous weathered crackle around the outside, and I love the three new Paper Dolls perched in a row... and that the whole thing lights up just adds to the magic! You are always shinning too, inside and out, and your work is second to none! LOVED every make you made! These ladies all in a row scream fun times! LOVE that is lit up too...icing on the cake. SO HAPPY to have seen you again! What a wonderful project! I loved the painted paper dolls and the fact that it lights up is amazing! This blew me away! And now that I know how you made it, I am in even more awe. WOW! Wow! I love the crackles! It's a pity I never have enough patience to wait till they make themselves and I always heat them with a heat gun. Left overnight look much better! I love the new dolls, too and the way you gave them such a pastel clothes. Lovely panel! Stunning! Your paper dolls are amazing! Lights! Camera! Action! The lady in the middle seems to be the only one ready. My favorite part is the frame and the crackle. I’m totally in love with the look you got! Can’t wait to try to emulate it!! Paula, love this box... so clever. Love the images, colors and overall look! Love your project! I really appreciate the tips on using the distress crayons. Can't wait to try this! So much detail! And lights! I am looking forward to roses and all the new pieces you used. Thanks for the directions for distressing the box. I love how the crayons work with the paper dolls. Thanks for sharing. So fun! Great job making the tray look so worn. The dolls remind me of the portraits I used to pose for with my sisters. TFS! Awesome. Love the project start to finish. And it all looks so real. Lovely! That texture on the vignette box is just amazing! I hail from a photography background so i'm a sucker for hand-colored photographs. Love the Distress Crayon coloring technique for the gals... will have to try that in the future. This piece is simply amazing! Love the paper dolls; thanks for the tip about using distress crayons to color them. Always a delight to see what you create! Love this one. Charming, delightful and so much more! I hope you will share more of your projects in the days to come as I love seeing the details. I love the vignette boxes! But what I love more is seeing the fantastic things that can be done with them. I love this piece, and the fact that you put a light behind it too, is such a great idea! Thank you so much for sharing and inspiring!! I just bought some Crayons and wondered how to use them on small items. Thanks for sharing all your techniques to us amateurs who want to follow in your footsteps! The CRACKLE...awesome! Wow Paula, what a fabulous use of Tim's products. The tray with all the embellishments and color is great! Thank you for your inspiration. Stunning! As always the details are amazing. Love the lights behind the girls, the crackle finish, the coloring of the paper dolls, all so beautiful! This is definitely a favorite from the Idea-ology booth. Thank you so much for sharing your gorgeous project with us all. I really like this! The gals remind me of photos I have of my Mom and her friends from way back. I love the crackle and thank you for sharing tips on hot to use the distress crayons. This is so pretty. I love how you used the crackle paste. I love how your painted paper dolls are just sitting there enjoying themselves. So beautiful with crackle paint, light and clips. You always have such amazing projects. I am loving these new paper doll cast. I can hardly wait until they are in stock. I love this project, the painted ladies, the chips in the paint, and how it lights up. Thanks! OMG ... it's " Shabbilicious " , love, love, love the new cast ! You will be the found relative paper doll Queen forever ! I so love how you colorized and "staged " the girls... just awesome !! waiting for my goodies to arrive so I can start a project. love those new paper dolls. thanks as always for sharing. Amazing Paula - your projects are just amazing. I can't even wrap my mind around all the details until you take us on a journey through your project! The crackle, the lights, the transparent collage paper, the "x" nail heads... Sigh - you just continue to amaze me! Love it! Love the crackle. Love the crayon tips and the special touch it makes on the girls. And love the lights. A wonderful project. Thanks for the inspiration! What a beautiful piece, and I love all the details! I didn’t just like this tutorial I LOVED it! I like how you colored the paper dolls, I can’t wait to try it. The details. The tips. The patience to share. Love this. I always love seeing your work Paula! So awesome!! All the details, including the lights behind, brilliant!! Beautifully done! Awesome details. Thank you for sharing! I love this scene and all the great instructions. Such talent! The chippy finish makes it look like something you dug out of an old barn! I love it. Wonderful(as always). Fabulous techniques. Thanks so much for the detailed instructions! Thanks for sharing! Everything you make is awesome. Oh, Paula, this so amazing from the painted box to the painted ladies! Your projects are so amazing and your tips for coloring the dolls are brilliant! And lights, too! Just magical! Oh to take a class from you just once would be a dream come true! Thanks for the inspiration! This just made me smile. All of your attention to detail makes this piece come to life. WOW!! So love this and thanks for such inspiration. Wonderful project, and great directions! WOW, and it lights up too!!! Love the tips on blending the Distress Crayon into the crackle...never thought of using the Distress Blending Brushes for that...and the mottling with the baby wipe may be what I am missing...I tend to wipe off too much and add it back, wipe it off, add...you get the picture...LOL. Love this project from the crackled tray to the 3 girls perched on the ruler, and EVERYTHING in between. Oh, and those Hardware Heads are a favorite! Great tutorial and tips on coloring the Paper Dolls with Distress Crayons. Thank you for the inspiration! Thank you for being so generous in sharing your how-tos with us. Such beautiful artistry and I always love learning more about Distress Crayons! Love the grunge. And the back lighting? Amazing! Love the crackled distressed box!! Paula, as always, you have created your project with such vintage goodness...love it. Oh, I'm definitely going to make this! Can’t wait to try this, it’s beautiful. 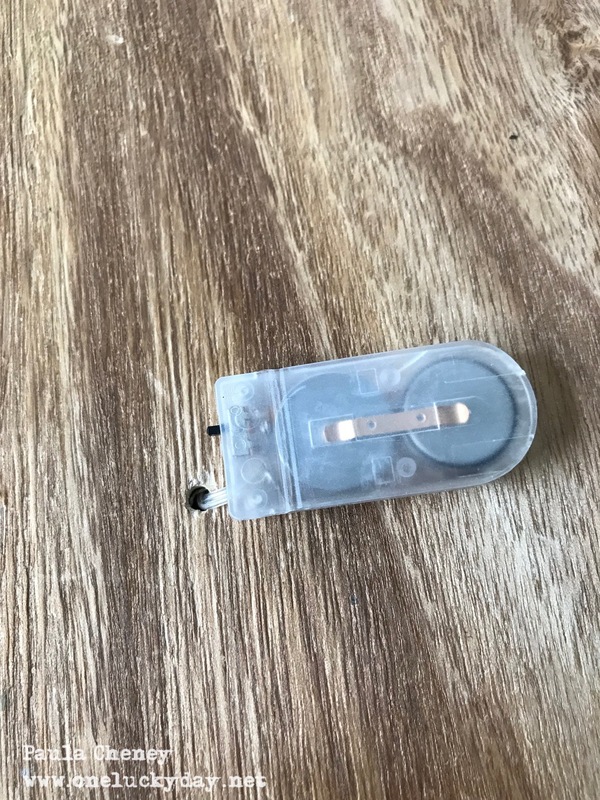 Need to wait to get a few items first, when they come in,but this is first on my list to do, thanks for the clear information on how to make. Love your project! Thank you for the tinting tip. Love all the details on this vintage work of art! Gorgeous coloring, and the crackle...so love! 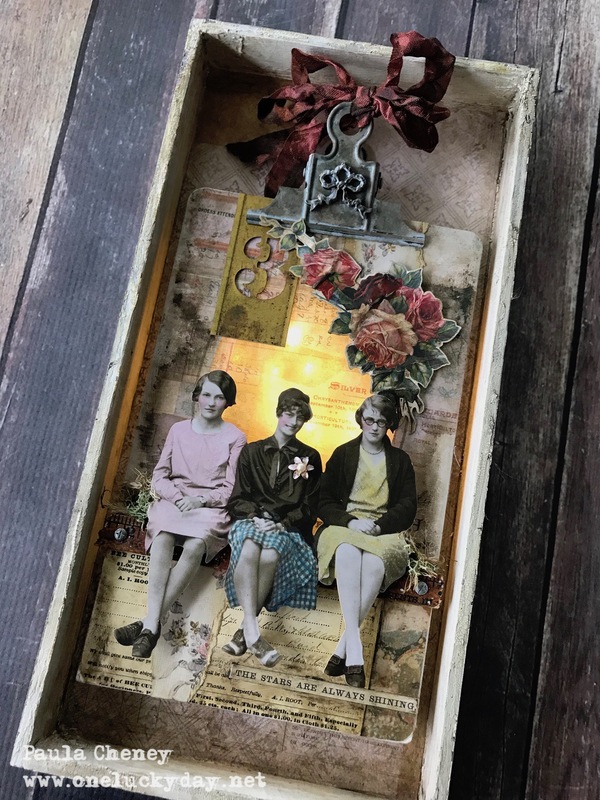 What a fabulous grungy shadow box!!! I love the colours of the ladies' dresses. and the light behind the scene!!! Oh Paula I love this shadow box !!! Everything is so vintage and the cracking, grunge on it is what makes it … totally awesome !!! The girls, the way you have them coloured and so very much more !!! This project is to die for. I love the way you tinted the characters too. Absolutely awesome. Thank you for sharing your talent! Such a gorgeous piece - I love every part of it. The crackle on the frame is just stunning and the light is just an amazing addition. Absolutely stunning! Such an amazing piece , love the light at the back. Thank you so much Paula for sharing this fantastic project. I really must get myself some of those trays - you have definitely inspired me to try to do some shabbying! what a difference it makes. Thanks for sharing! haha...love the 3-d girls hanging out on the beam there! Great shadow box and filled with lots to look at! TFS! Lovely creation, I like the light on the background. Fab project as usual. I have been a fan of yours for years. You are a master at creativity! Wow! What a wonderful project!!! Thanks for sharing!!! Absolutely PERFECT. I love all your fabulous details. Made me say 'Awwwe'! I love making shadow boxes & this one has definitely inspired me. And thank you for the tinting tips! Wow! Gorgeous project and a new (to me) crayon idea to try out. Thanks for the inspiration. The ladies remind me of my childhood, the vintage effect is gorgeous. As usual, beautiful. Thanks for sharing. Oh Paula, I promised myself that I would not buy paper dolls anymore, but after seeing them on your magnificent shabby tray, how can I resist? I love this project in all its parts .... and then also the lights? What a brilliant idea !! Congratulations on ALL your projects that are always amazing! Another fabulous project - love learning your techniques. More paper dolls in my future. Thanks for sharing. Oh my word! Anything with lights is next-level crafting in my opinion! 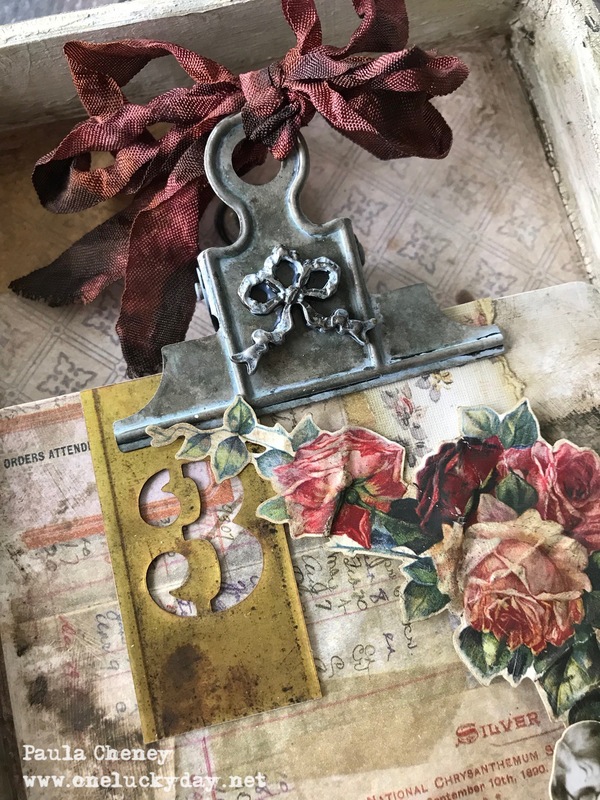 So much goodness here - not just the light, but also your technique for distressing the tray, the colored paper dolls, and the bow on the clip is genius! Thanks for the eye candy! Love those vignette boxes with the crackle. And the fact that it lights up.....awesome! Wow! Just wow! Absolutely gorgeous. I love those paper dolls. Thanks for sharing. The crackles on the tray are awesome. Love the backlighting of the girls also. I love this!! The girls are perfect!! Your project is lovely. Thanks for the short tutorial as well. The three young ladies look so perfect sitting in the shabby antique box. So much to love on this! The crackle is fantastic, the photo tinting is amazing. I love this! Ha-Ha Paula, I LOVE this, but do tell Tim that he needs to get some older folks in the paper dolls...some of us are no longer in our 20s or 30s. :D I would love to make something like this for myself and friends who are in our "golden years". Thank you for the inspiration! Wow! Brilliantly done! Love this!!! And thanks for the tut! 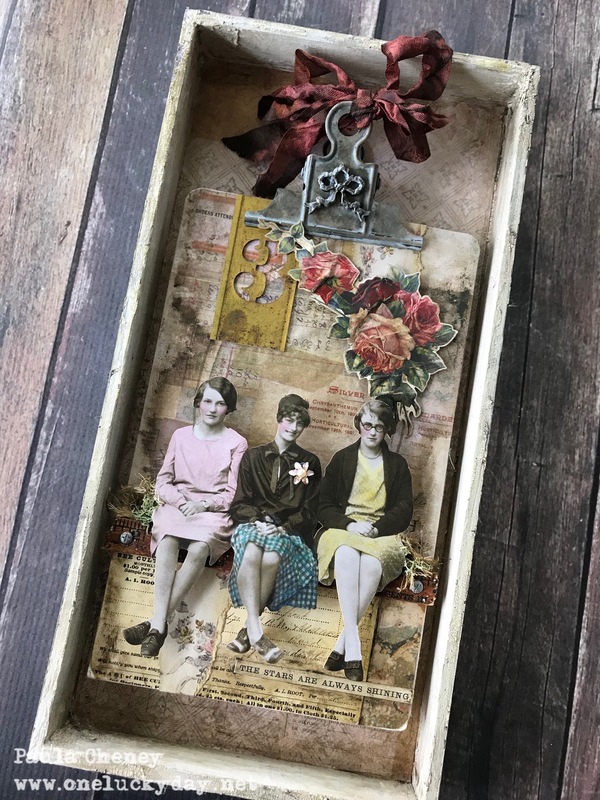 Love the three ladies sitting on the shelf in your delightful box Paula! Love the coloring of them with your Distress Crayons! I would love to spend just one day with you creating and watching your process! I use q-tips a lot to color the paper dolls too!! thanks for all your inspiration! I always love your tutorials! Love this. And yes, you are a star always shining too. LOL! Facinating, love the use of light. Paula you're the vintage Goddess!! love this share! Great project Paula! Love the texture and look of the frame! And the vintage style! Fun with the lighting. Your creativity is awesome. I love how you colored your paper dolls. And the tray is simply gorgeous! Thanks for sharing! Love all aspects of this tray. 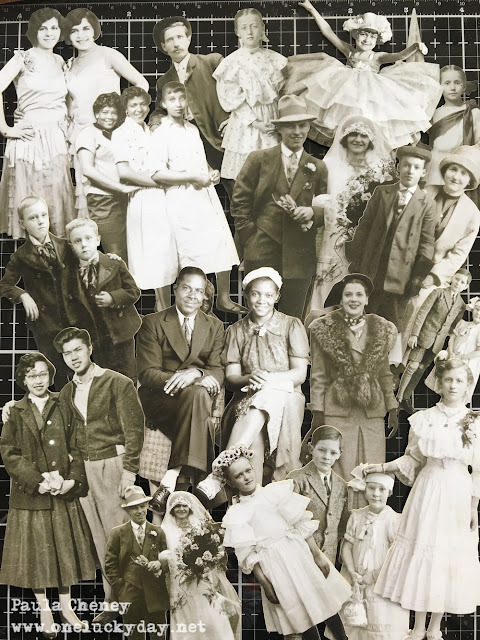 Your coloring of the paper dolls reminds me of what my dad did with black and white photos. Paula - you are always astounding. Appreciated the step through on coloring the models. I'll have to try that technique. Wonderful project! Wish I had this piece in my house. Its just the kind of quirky assemblage I love! I really enjoyed reading along on the how you did it. Its GENIUS! Paula, another little piece of heaven. You’ve inspired me to do some coloring on the Paper Dolls. Absolutely amazing Paula! I love the grungy tray and the tinting on the paper dolls in fantastic...time to get my Distress Crayons out! Love the back lighting effect. And it’s nice that you had help! Amazing work Paula. Love the layers, the crackle border... the touch of coloring on the picture... the vintage roses are gorgeous... love the light! Such a cool design. What a great shadow box! I love the trio of girls and the gorgeous crackle! fabulous tutorial - and I learned some things - like coloring the girls. Who would have thought?? love everything about your project, especially the lights behind these beauties. Thanks for sharing! Paula, thank you for the tutorial. Love the project and you have inspired me to color my dolls. Thanks. I love your tutorials, Paula. These three girls have it going on...and the lights are genius! Just love how you have created all of this and the lights, well that just puts it over the top!!! Beautiful and great explanation of how you created everything! Thanks for sharing! Just wonderful, love the vintage theme! Wow Paula! What a great project and tutorial! I always learn something new when I read your blog posts. The tips about the Qtips and crayons for the paper dolls will be invaluable. Those paper dolls are the best! I use them a lot for different projects! Fantastic job as always! Congrats on a great show! Wow, wow, wow....wish I was talented enough to replicate! Love the altered ladies dresses with color! I am always so in awe of your projects, Paula! What a treat to get to read about your process. Love all the detail! Amazing layers and amazing texture, and adding the lights behind is a stroke of pure genius! This reminds me of me and my 2 friends, the three musketeers. Love how you added the color to the girls. Paula - thank you, thank you, and thank you !! I learned SO much from reading your process. Love every little details and thanks for sharing some great tips :) Can't wait to get my hands on that tray! FAB project! I love the way you decorated the tray! Love it all Paula, the great coloured girls, thanks for the tip of the crayons, the light is stunning and every detail makes is more and more awesome. Thank you so much for the great tutotial and sharing this masterpiece with us. Amazing project, Paula, as always! You always have the best ideas! Love the idea of the Collage paper over the frame, and lighting it from behind! Genius! Great tips on colouring too! Great inspiration for using the boxes. This is a wonderful project! I love the light shining behind it. Great idea! I always love reading your blog posts because you include the best tips and details! This project is so lovely. The crayon coloring on the paper dolls looks great. I was thrilled to find out that it lights up too! I'm addicted to adding lights to projects and just love that aspect of yours! Another fantastic Paula Project - LOVE it! Beautiful work as always, I can be inspired by what you do, I love the dolls, the lights it a hit! This is just beautiful! So many details! I adore all the different elements used in this project as well as all the different techniques. I love the colouring on the paper dolls and the crackle finish on the tray. The light is fantastic! Thanks for showing! Thanks for all the tips, especially the crayon coloring effects!! 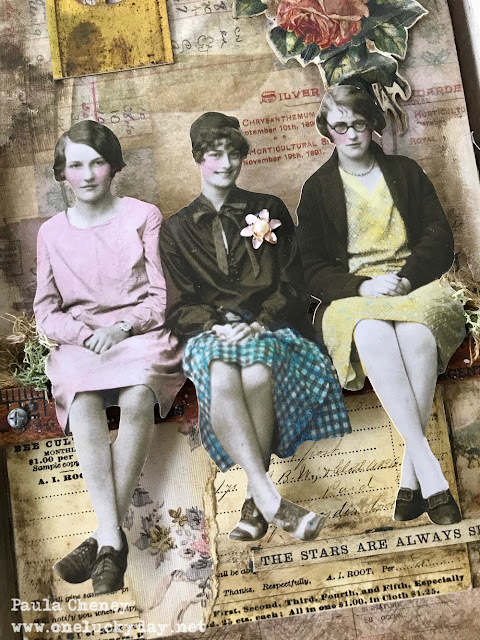 Love the crackle, great vintage look, like the way you added the coloring, great project! Amazing tray! The shabby chic look and the design are stunning. Love how you "colorized" the photos and the backlight is genius. 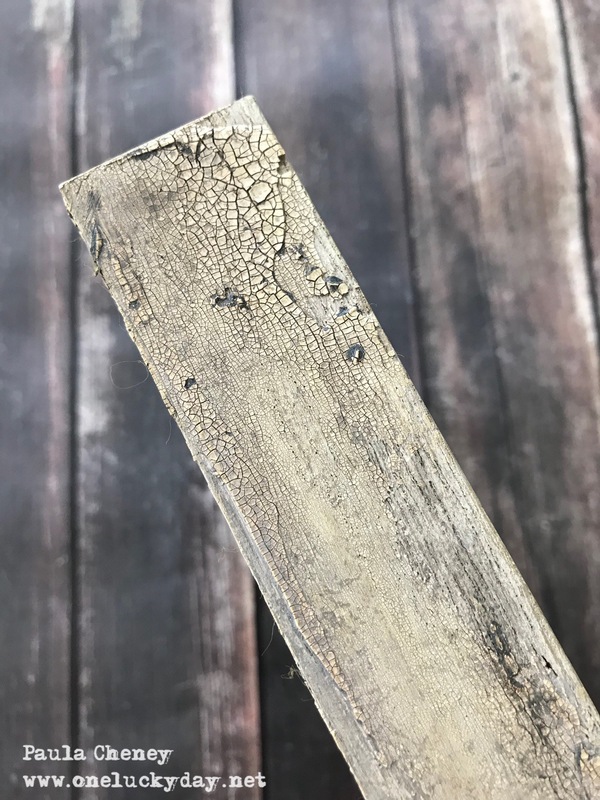 That weathered crackle finish sets the tone for a fantasticly shabby piece! This is very cool. I like the pops of color and the distressing on the frame. The backlighting is a fantastic touch. Really like the distressed look to the frame. I hope to use that technique on a project of mine! TFS! Paula, you did such a fantastic job at Creativation! Thank you for sharing the wonderful projects. Your piece is magnificent, as always. Thank you for explaining how to use the crayons to color the paper dolls. The new lace frames are another beautiful product that I'm excited to try. Fantastic project! Thank you for the tips about coloring with distress crayons- I've been having some trouble getting consistent results. Thanks for sharing this fabulous project! Your explanation of each step is a treasure to me and it’s giving me the confidence to try this project for myself. Thank you! Love seeing ways to use the vintage trays and collage paper. Keep the ideas coming. Gorgeous project ! And thank you for the tips - I can't wait to try tinting. Faboulous project with so much detail. I can just imagine three best friends sitting together enjoying each others company. Wonderful vintage feel with this project, very pretty and with so much detail on every surface. I love the crackle on the edges and great vintage feel with the colors you used. Great instructions which I feel really helpful if I want to attempt to create a similar project, thank you. Wonderful piece. I love the use of the lights yet it is just as phenomenal without them on. Attention to detail...so appreciate it! Love how you used the hardwear heads...I’m envisioning them in so many places and can’t WAIT for oodles and goodles of those hardware heads! Thanks for sharing! Love this project. I have the distress crayons but rarely use them. Your project is a great inspiration to start using them. Lovely project and the light gives it that extra something too. Great techniques and beautiful result. I haven’t tried the paper dolls yet but want to now. You just have the most amazing ways to alter just about anything to look as if it came from the previous century. 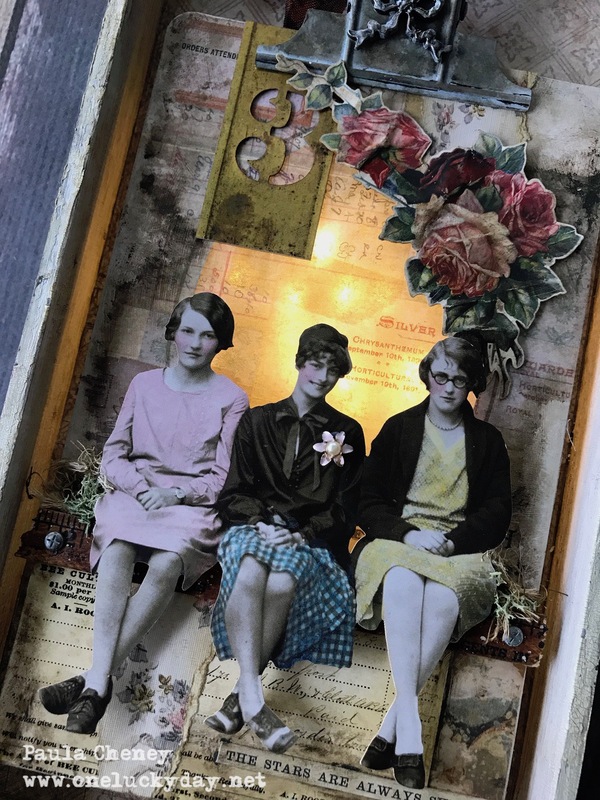 Paula - I love the crackly edge and the grungy look, but am most excited to try to color the paper dolls with the distress crayons instead of the markers. Thanks for the tutorial. Thanks for sharing! Your projects are always fabulous and I love how you added "light" to this one. I also like the idea of using the distress crayons to paint pics, I've just used the inkpads before but like the intensity of the crayons! What a wonderful project. I love the boxes and people, especially when colored. The tip and technique for tinting the paper dolls is really special!! Thank you so much! I'm a fan!! Thank you so much for sharing. Love those trays. Awesome! Thanks for all the tips, always wondered about using the crayons differently.